Everyone who knows me knows that my family loves tech gadgets. Whatever the new tech is that’s out… we want it. I’m not as tech savvy as I’d like to be, but lucky for me, I’m married to a very tech-savvy man. And everyone who knows me also knows that I live away from my family. Since my parents live almost 300 miles away and I have a son who goes to school, we can only make about two visits a year — summer and Thanksgiving. So when my son and I when to visit my parents for Thanksgiving last week, we took them a gift. 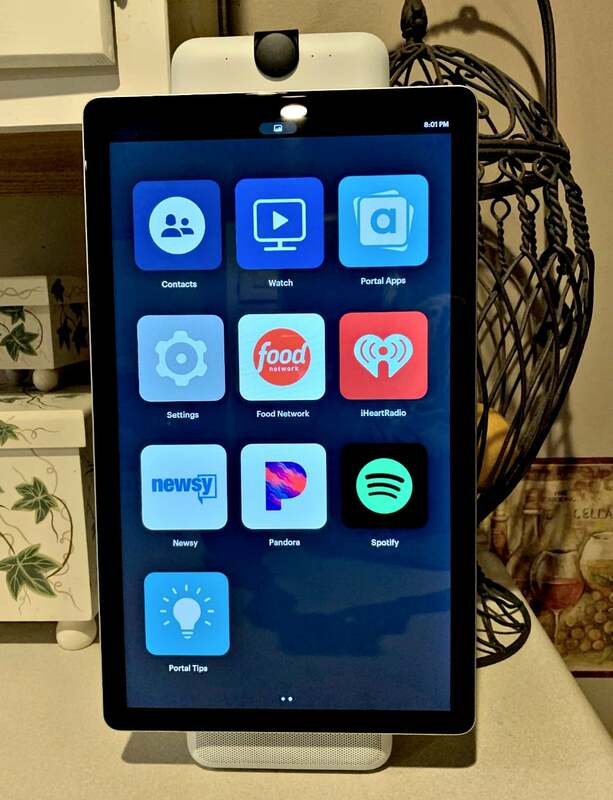 A gift that will help us connect with my parents more easily. 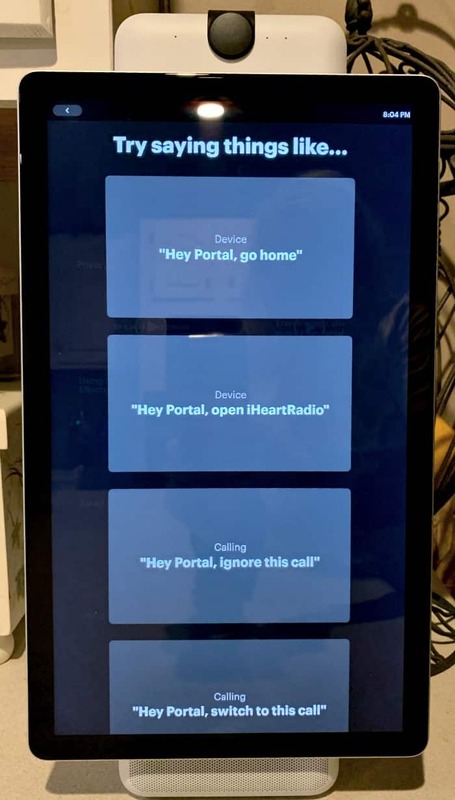 A Facebook Portal. 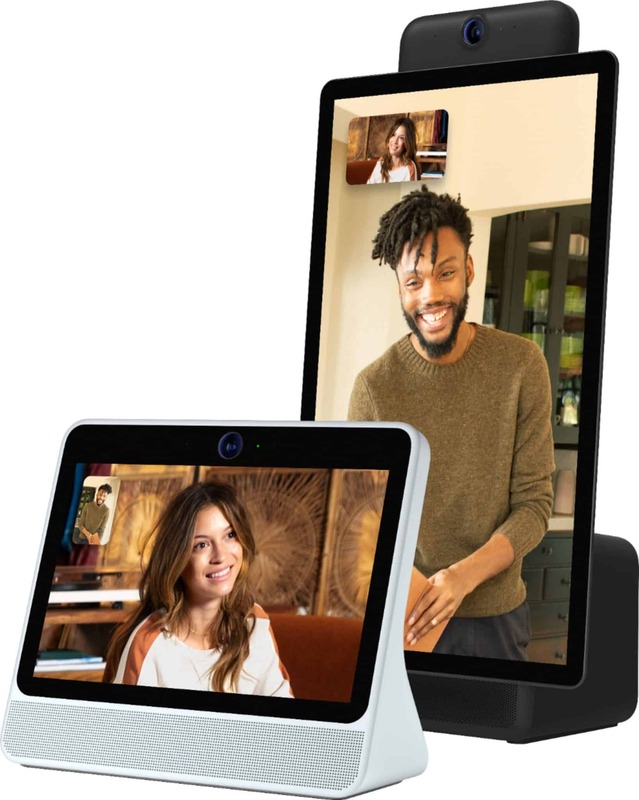 Facebook Portal is a home video communication device that makes it easier to connect more regularly with the most important people in your life and share the little everyday moments that relationships are built on. 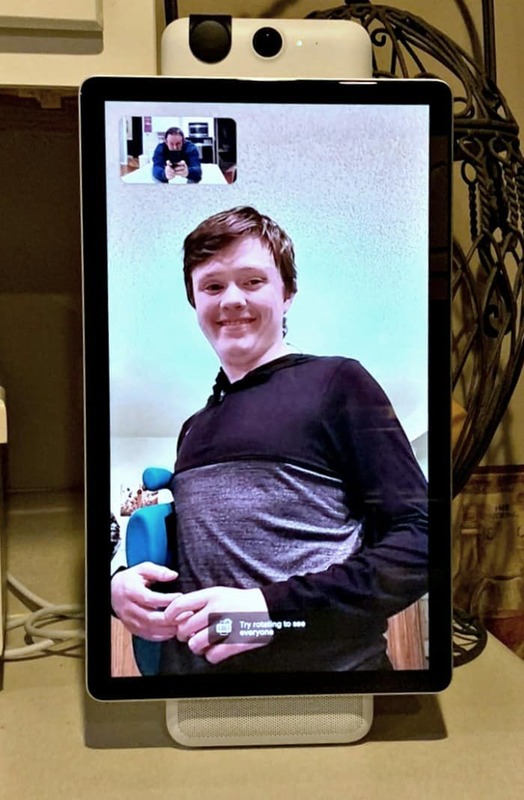 Connecting through Portal feels less like being on a video call and more like being together in the same room, even when you’re miles apart. 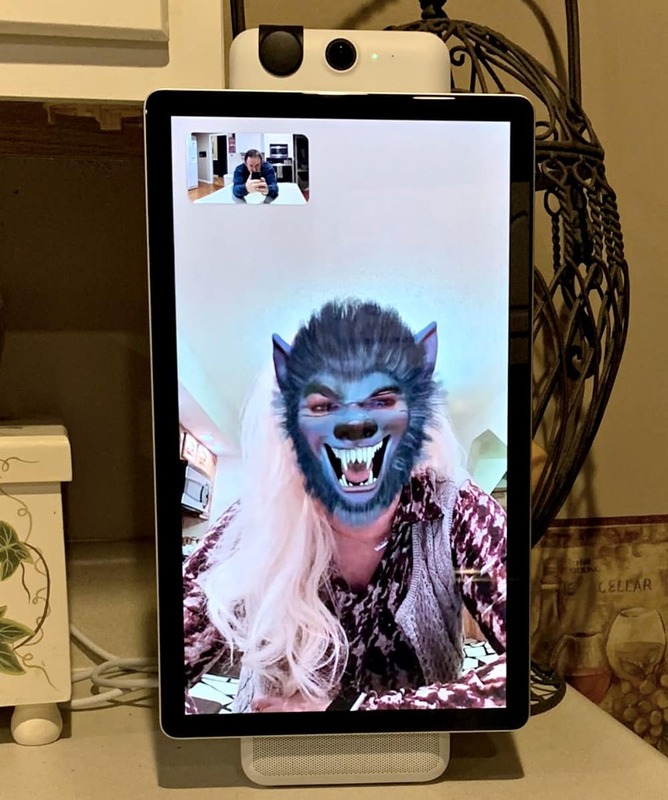 While we were at my parents we got to try out the Facebook Portal with my husband. He had to work the day before and the day after Thanksgiving, so he couldn’t travel out of town with us. I hated that he had to spend Thanksgiving home alone but the Portal made it more bearable for him. And it really is like being in the same room with someone since you can walk and move around your room and you will always be in frame. It’s hands-free, so you don’t have to move a camera around. As I mentioned above, I’m not super tech savvy and oftentimes have to ask my husband for help. But the Facebook Portal could not have been easier to set up. All you need is a Facebook account. Seriously. So easy. 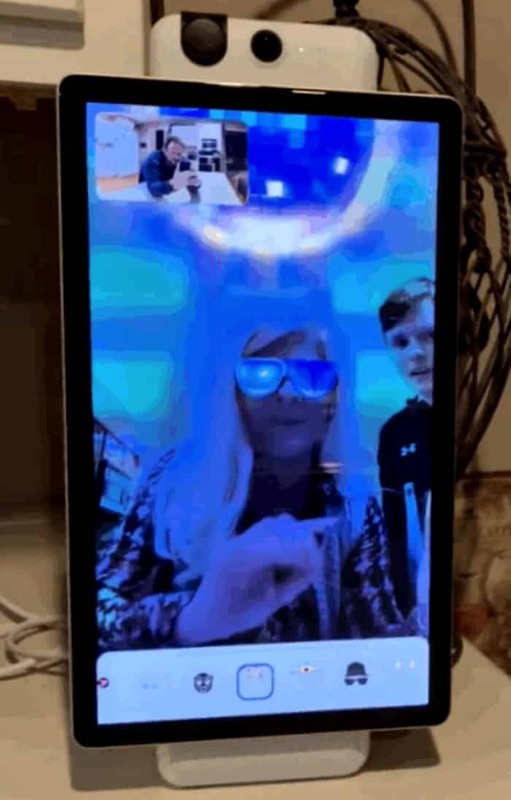 I did it all by myself, both the Facebook Portal and the Facebook Portal +. 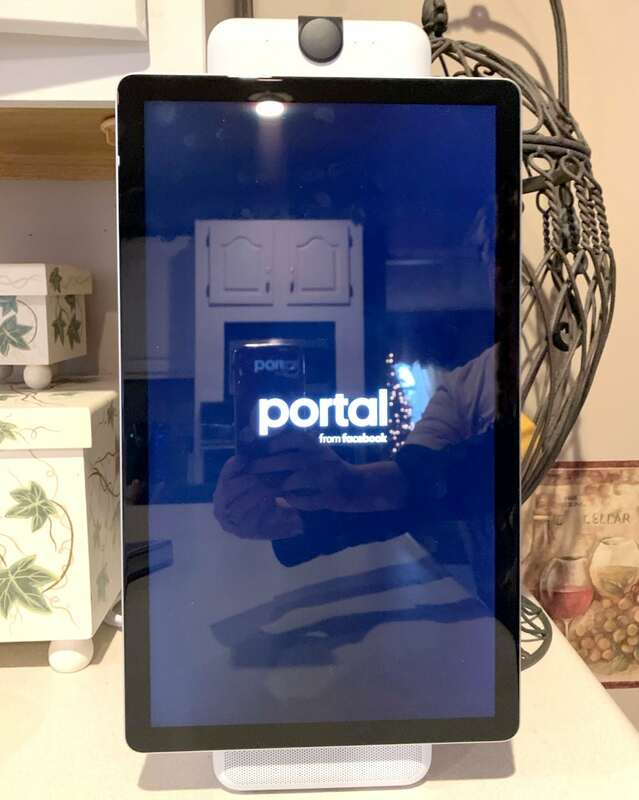 You can set up the Portal anywhere you want… both my Mom and I have it in our kitchens (the hub of our home). Okay, the filters are so much FUN. I think everyone had fun talking through Portal and trying out the different filters. I don’t know what it is about filters, but it turns a conversation into so much more. 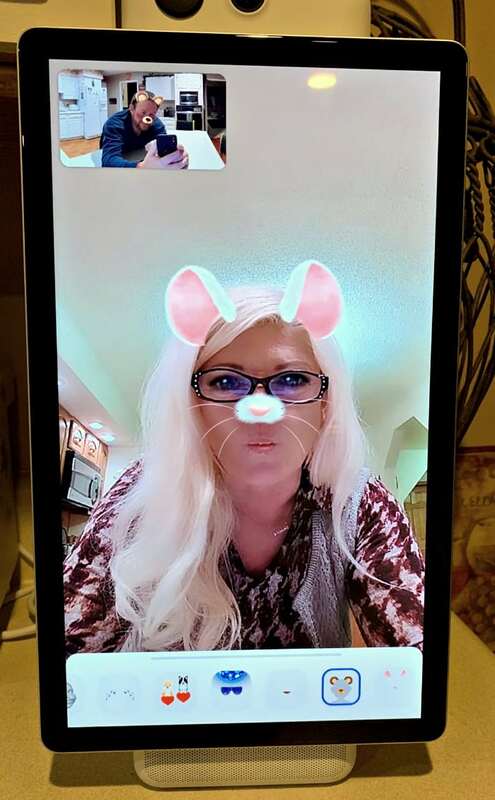 See, I told you the filters were fun! It didn’t show so will in the photo, but the funky disco ball filter is the coolest (and my favorite). 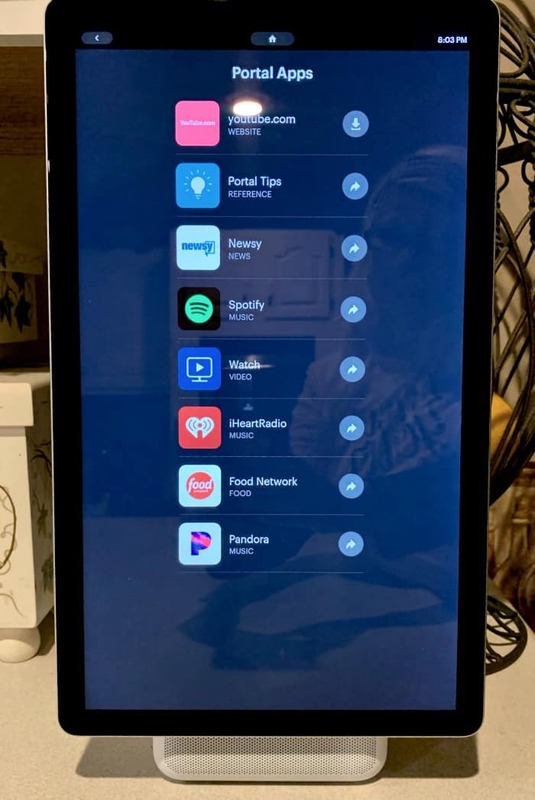 With Alexa built into the Facebook Portal, you can play music, either with Amazon Music, Spotify, iHeartRadio, Pandora, or play your favorite radio station on TuneIn. You can ask Alexa for the weather, recipes, and any question you want, get the news, and much more. 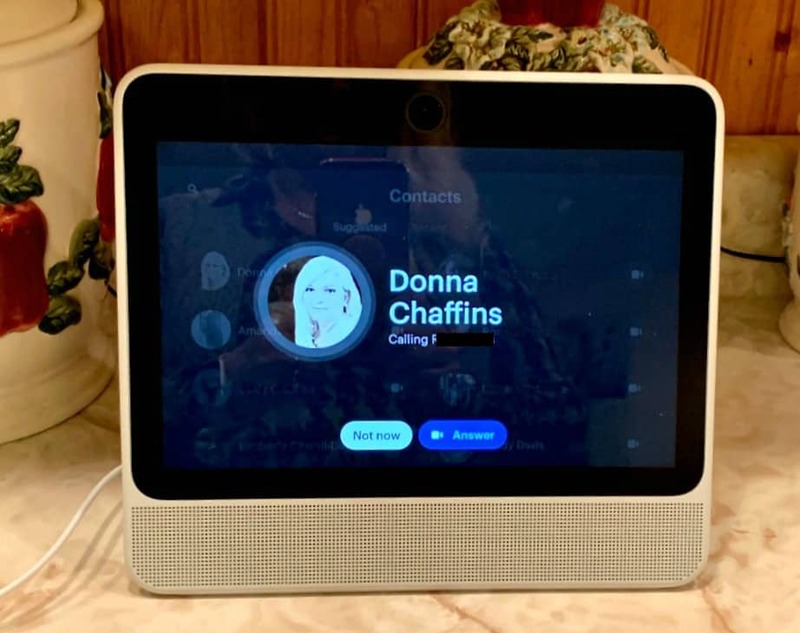 The Facebook Portal and Alexa are a perfect marriage. I like that you can select your Facebook photos to display on the screen (each photo stays up for one minute). 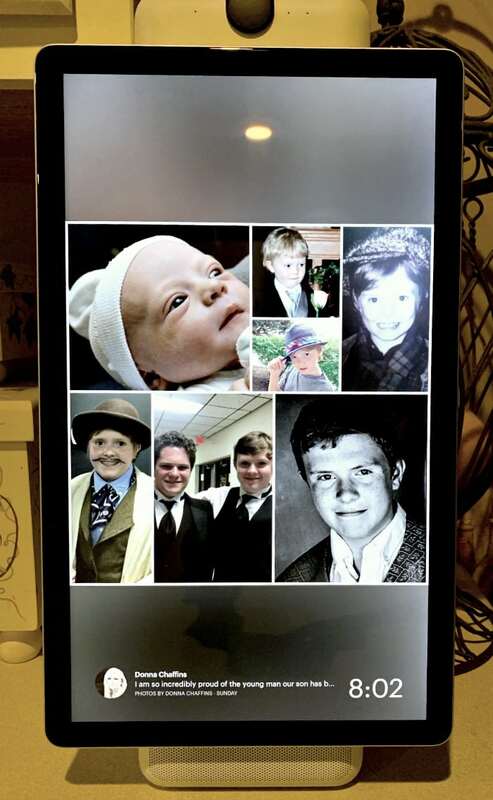 My Mom especailly likes this feature since she loves seeing photos of family displayed. 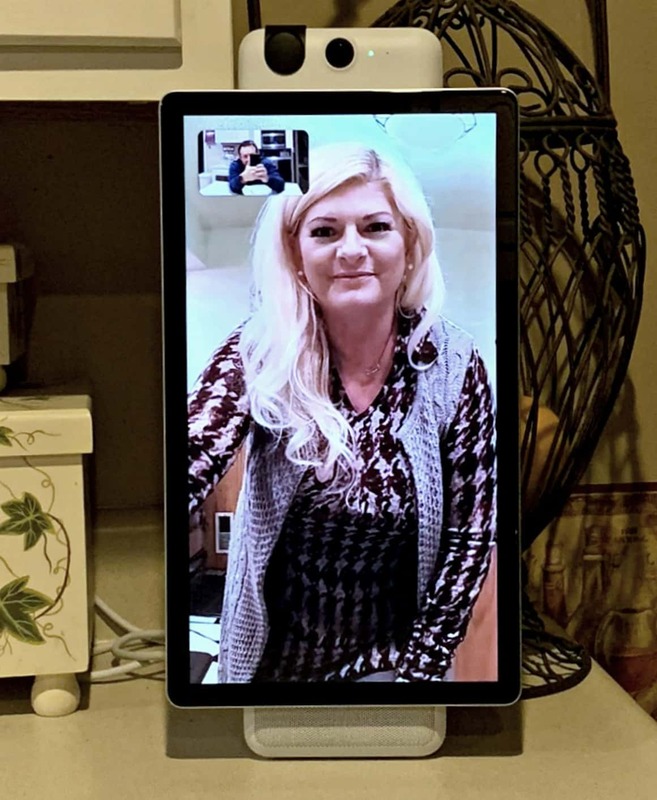 So… even though I’m not living close to my Mom, I can use my Facebook Portal + with Alexa to not only talk to her but see her anytime I want on her Facebook Portal with Alexa. And neither of our lives are interrupted since it is completely hands-free… my Mom can make her famous meatloaf while I watch and take notes. Although I make it exactly like she does, it just does not taste exactly as good as hers. Save $100 when you buy two (2). Click HERE for more information on this great deal.